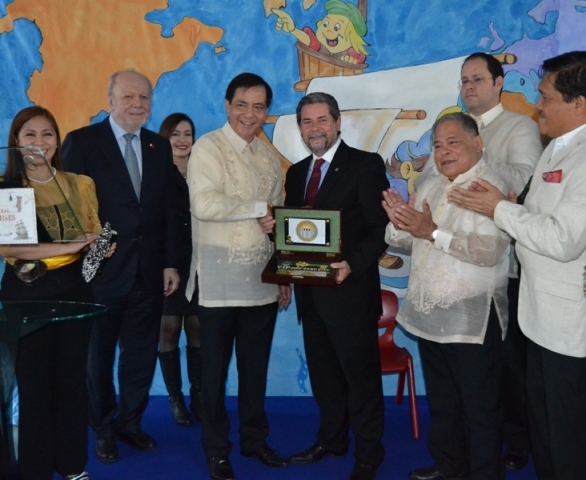 Mayor Michael Rama of Cebu City presenting Mayor José Manuel de Carvalho Marques of Sabrosa with a symbolic key to the City of Cebu. This relationship between Cebu and Sabrosa will provide a framework for the pursuit and development of fruitful exchanges in the areas of culture, trade, tourism and education between the two cities. Sabrosa is in the north of Portugal, where a large number of its commercial and industrial entities are located and in the heartland of Portugal’s famed Douro wine producing region. In addition to presenting Mayor Marques with the key to Cebu City at the signing ceremony, Mayor Rama also pledged to donate a replica of the Sto. Niño of Cebu where it will be placed in one of the churches in Sabrosa. In turn, one of the main roads emanating from the Magellan monument at the western entry point to Sabrosa has been named Avenida Cidade de Cebu in honor of the relationship of the two cities. During their stay in Sabrosa, Mayor Rama and his delegation also attended the 3rd Meeting of the Network of Magellan Cities. The Network, which has its Secretariat based in Seville, Spain, envisions to bring together the 20 cities that were encountered durin Magellan’s circumnavigation of the world.